Born in 1854, Ada Tyrrell was a minor poet and Irish socialite who is known in literary terms for her Great War poem, My Son, which caught the public attention when it was published in 1917. She was the daughter of the academic Robert Yelverton Tyrrell who contributed to Trinity College in Dublin where he was the Professor of Greek for a number of years. Not much is known about the details of her life but she was thought to be a good friend of playwright George Bernard Shaw and one of the most gregarious individuals in Dublin at the time. Well known for her wit and keen intelligence, Tyrrell ran a salon in Dublin to which the good and great, including many politicians and artists used to come to visit. She married Sir John Perronet Thompson whose own father was a great reformist and was, for a while, governor of Sierra Leone. Her poem, My Son, was published during the First World War and has been repeated in a number of anthologies ever since. It is a poignant work that reminds us of the pain every mother feels when a son or daughter goes off to war. The poem compares the possessions and memories of the child with the man who now stands in the trenches fighting on foreign soil and her selfish wish that he be returned home safely to her. The poem first appeared in A Treasury of War Poetry that was published in 1917, a year before the conflict actually ended. 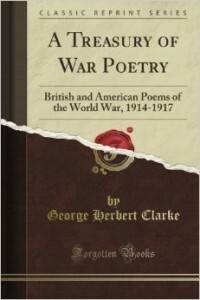 The collection was edited by George Herbert Clarke and the poem caught the public’s attention more for its sentiment rather than the technical ability of the poetry. It was the only work that Tyrrell published over her lifetime but has endured to this day as the perfect example of a mother’s love for her child at war. She died in 1955 when in her nineties.